looks to gain extra yardage after catching a pass. The Shorewood and Shorecrest football teams both will play Western Conference 3A crossover games at Shoreline Stadium Friday, Nov. 1. 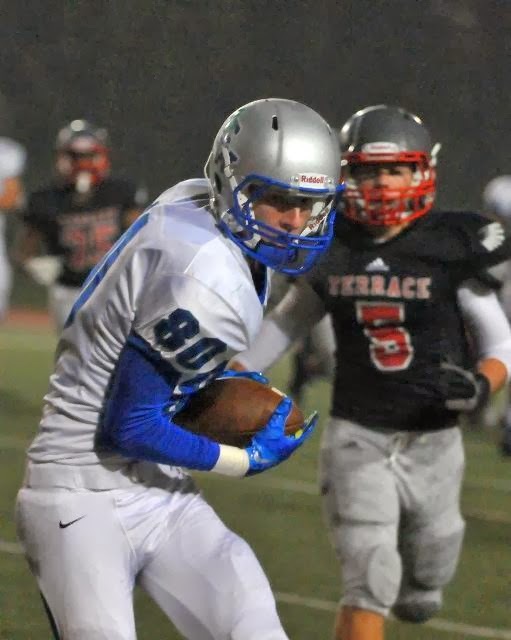 Shorewood, which finished fourth in the Wesco 3A South with a 1-3 record (2-6 overall), will meet Wesco 3A North No. 4 Marysville Getchell (1-3 Wesco 3A North. 4-4) at 5 p.m.
Then, at 8, Wesco 3A South No. 5 Shorecrest (0-4 Wesco 3A, 1-7) will meet Wesco 3A North No. 5 Everett (0-4, 0-8). Shorewood’s 5pm game with Marysville Getchell will be a rematch of a Sept. 20 game, which Marysville Getchell won at home, 28-14. Shorewood’s 56-14 loss to Mountlake Terrace Friday, Oct. 25, gave Terrace third place in the Wesco 3A South and the chance to play Stanwood of the North division Friday, Nov. 1, for a guaranteed place in the quad-district playoffs Nov. 8-9. 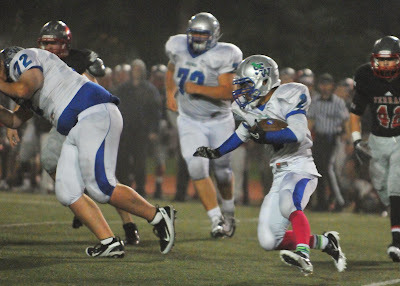 Rikio Campbell ran for both Shorewood touchdowns. Thunderbird running back Rikio Campbell follows the block of team mate Darin Wade. In Shorecrest’s 27-16 non-conference home loss to Marysville Getchell Friday, Oct. 25, Scot quarterback Nik Hendricks threw for one touchdown and ran for another. Both Shorewood and Shorecrest will finish their seasons Nov. 7-8 against other teams that haven’t qualified for district playoffs.